It’s many months since the home grown tomato season ended and it’s not even time for sowing tomato seeds yet. But tomatoes are still being grown in England in the depths of winter. 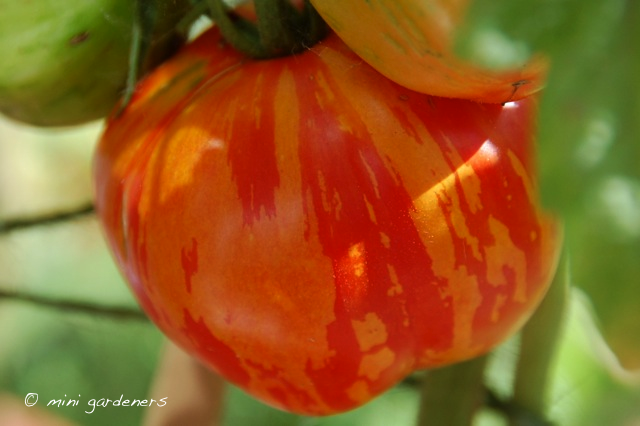 If you’re interested in a glimpse into the world that is commercial tomato growing, then take a peek at this new website for Thanet Earth, designed to be a resource for children and students, but equally interesting for adults. If you haven’t heard of it, Thanet Earth is the largest glasshouse complex in the UK, growing peppers, cucumbers and tomatoes. The scale of the operation is staggering, each glasshouse having the footprint of about ten football pitches. The way in which the crops are grown is a feat of science and engineering – and about as far removed from growing a few pots of tomatoes on your patio as is possible. The tomatoes are grown year round and there’s no soil in sight. They’re grown hydroponically i.e. in water to which nutrients are added. Computers control the flow and content of the nutrient solution, together with heating and lighting. Rainwater collected in on-site reservoirs supplies some of the water needed and on-site generators pump their by-product of carbon dioxide into the glasshouses. The clinical approach pays off in terms of reduced numbers of pests and diseases and hence fewer pesticides. The first line of defence for any problem is biological control or using ‘good bugs’ to fight the ‘bad bugs’ as they describe it. All very interesting food for thought which I’ll bear in mind next time I toss a punnet of cherry tomatoes into my shopping trolley in the depths of winter. Categories: education, grow your own | Tags: growing tomatoes, hydroponic, Thanet Earth | Permalink.